Gregg Braden is a clear example of a Matrix Sophist. But not only that; he is a clear example of a Matrix Fascist (see my entry on The Matrix Conspiracy Fascism). Reviewing Susan Jacoby's book, The Age of American Unreason, Wendy Kaminer sees Deepak Chopra's popular reception in the USA as being symptomatic of many Americans' historical inability (as Jacoby puts it) "to distinguish between real scientists and those who peddled theories in the guise of science". Gregg Braden is another example, and with his fascistic and direct racistic theories he is in my view more scary. The reductionism called biologism is a central part of The Matrix Conspiracy. An example is Richard Dawkins (and Daniel Dennett – which I will return to). Though Dawkins certainly neither can be called fascist nor racist, I clearly see him as a Matrix agent though. His words about that “religious people are hijacked by an infectious malignant god-virus, because god is delusion a ‘psychotic delinquent’ invented by mad deluded people,” or his description of “religion as both an evolutionary by-product and as a memetic virus” is pure Agent Smith (from the movie The Matrix – see my pop culture file on The Matrix). And when he then states that this is something he, and his “skeptic” followers, or atheists as such, are raised above, then we have to do with unintended fascism. Dawkins´s explanation of memetics, or "cultural evolution", and how our sense of morality evolved, is utterly nonsense, and fully in line with the Darwinistic fascistic nonsense of New Age. Richard Dawkins is the atheistic answer to Ken Wilber. Both are biologists who want to be philosophers instead of the philosophers. Both are in love with Charles Darwin and his theory of evolution. Both want their own discipline to be the answer to all the riddles of the universe. And both therefore ends in two versions of biologism (two versions of Social Darwinism). They are two sides of the same coin. See my articles A Critique of Richard Dawkins and the Committee for Skeptical Inquiry (CSI) and A Critique of Ken Wilber and his Integral Method. But Ken Wilber is not the only New Ager fascinated with biologism. It´s a central part of the New Age movement as such. And it comes from Theosophy (see my article The Fascism of Theosophy). Some New Age directions even claim to be examples of atheistic spirituality. An example is the Canadian Raelian movement. Gregg Braden (born June 28, 1954) is an American author of New Age literature, who wrote about the 2012 Phenomenon in his book Fractal Time: The Secret of 2012 and a New World Age and became noted for his claim that the magnetic polarity of the earth was about to reverse. Braden argued that the change in the earth's magnetic field might have effects on human DNA. He has also argued that human emotions affect DNA and that collective prayer may have healing physical effects. From 1979 to 1990 Gregg worked for Fortune 500 companies such as Cisco Systems, Philips Petroleum and Martin Marietta Aerospace as a problem solver during times of crisis. He continues problem-solving today as he weaves modern science, and the wisdom preserved in remote monasteries and forgotten texts into real world solutions. The fact is that Gregg Braden is an ex-computer programmer, who presents himself as a scientist and modern-day prophet at the cutting edge of research into our collective destiny and the science of prayer. So, it´s no surprise that he believes the whole reality is a computer program, which we have to learn to programme in the right way; that is: in Gregg Braden´s way. He is attracted to the so-called Simulation theory. You can see this idea discussed in this article in Scientific American, by Clara Moskowitz, April 7, 2016: Are We Living in a Computer Simulation? In modern discussions about the reliability of our cognition you often meet a variation of Descartes´ argument of the evil demon. The argument is: some day surgery will have reached so far, that you will be able to operate the brain out of a human being and keep it alive by putting it in a jar with some nutrient substratum. At that time computer research perhaps will have reached so far, that you will be able to connect a computer with such a brain and feed it with all possible data – that is: supply us with an experiential ”virtual reality”, so that we think that we have a body, that we have a life and walk around in the world believing, that we can perceive our surroundings, whilst we in reality only is a brain laying in a jar. It is this thesis the movie The Matrix is based on. It is also a central theme in New Age. A lot of so-called reductionists believe, that it is possible (again: see my article The Pseudoscience of New Age and Reductionism). There are computer scientists, who believe, that you can understand consciousness as ”soft-ware” and the brain as a ”hard disc”, and that you in a very few years will be able to decode a human being for the whole of its content of consciousness, immediately before it dies, and therewith ensure its soul an eternal life – admittedly on a discette, but what the hell, it is after all certainly always better than to pass into nothingness, and the discette will after all could be played again and again. I have debunked this idea in my article The Dream Hypothesis and the Brain-in-jar Hypothesis. Like the other New Age biological reductionists who want to be philosophers instead of the philosophers, it can be difficult to see whether Gregg Braden is a materialist or an idealist. If asked he would probably at once introduce Doublethink, and claim he is both (see my entry on Doublethink). But this is not possible. In contrast to idealism, materialism concedes the primary of material, not consciousness. Which means, material exists before consciousness, material creates and determines consciousness, not vice versa. Materialists believe that material is the ultimate origin of the existing world, and they aim to explain the world via materialistic reasons. In philosophy, idealism is the group of philosophies which assert that reality, or reality as we can know it, is fundamentally mental, mentally constructed, or otherwise immaterial. Epistemologically, idealism manifests as a skepticism about the possibility of knowing any mind-independent thing. In contrast to materialism, idealism concedes the primary of consciousness, which means consciousness exists before material, consciousness creates and determines material, not vice versa. Idealism theories believe consciousness is the origin of the world and aim to explain the existing world by mental causes. So, Since Gregg Braden has argued that human emotions affect DNA and that collective prayer may have healing physical effects, as well as his believe in God, idealism must be Gregg Braden´s position. Berkeleyan idealism comes to mind. Richard Dawkins would, as a materialist, probably hate Gregg Braden, but as mentioned, I think they are part of the same pseudoscientific Matrix propaganda, streaming out from America. The American philosopher Daniel C. Dennett (another central figure the movement of New Atheism), is in his book - with the ambitious title Consciousness Explained - trying to explain consciousness, partially through computer analogies, partially through neurology and psychology. This is not so much different than Gregg Braden. Daniel Clement Dennett III (born March 28, 1942) is an American philosopher, writer, and cognitive scientist whose research centers on the philosophy of mind, philosophy of science, and philosophy of biology, particularly as those fields relate to evolutionary biology and cognitive science. In a nutshell, this is the same stuff which we hear from Gregg Braden, though Braden not even are close to Dennett in scholar-ship. Dennett is an atheist and secularist, a member of the Secular Coalition for America advisory board, and a member of the Committee for Skeptical Inquiry, as well as an outspoken supporter of the Brights movement. Dennett is referred to as one of the "Four Horsemen of New Atheism", along with Richard Dawkins, Sam Harris, and the late Christopher Hitchens. His position might be called scientific materialism. Many current and recent philosophers—e.g., Willard Van Orman Quine, Donald Davidson, and Jerry Fodor—operate within a broadly physicalist or materialist framework, producing rival accounts of how best to accommodate mind, including functionalism, anomalous monism, identity theory, and so on. Scientific "Materialism" is often synonymous with, and has so far been described, as being a reductive materialism. In recent years, Paul and Patricia Churchland have advocated a radically contrasting position (at least, in regards to certain hypotheses); eliminativist materialism holds that some mental phenomena simply do not exist at all, and that talk of those mental phenomena reflects a totally spurious "folk psychology" and introspection illusion. That is, an eliminative materialist might believe that a concept like "belief" simply has no basis in fact—the way folk science speaks of demon-caused illnesses would be just one obvious example. Much of Dennett's work since the 1990s has been concerned with fleshing out his previous ideas by addressing the same topics from an evolutionary standpoint, from what distinguishes human minds from animal minds (Kinds of Minds), to how free will is compatible with a naturalist view of the world (Freedom Evolves). Just try to say Consciousness Evolves instead, and you´ll have New Age. To understand that New Atheism is a central part of The Matrix Conspiracy Fascism, is important in order to understand Gregg Braden. The only difference is when it comes to spirituality. But as suggested, New Atheism´s ideas are pure pseudoscience, and could easily be replaced by New Age spiritual ideas. The bridge between science and spirituality is an expression you hear all the time within New Age. And they try to create “alternative sciences” all the time. Each new number of a New Age magazine or New Age promoting website with respect for itself, must contain at least one new “revolutionary” new “scientific” theory, which is the beginning to a “paradigm shift” in science. The number of new forms of “alternative sciences” within New Age is therefore today almost comically large. So, the “bridge” in New Age is built of sand, namely pseudoscience grounded in anti-intellectualism and anti-science. Deepak Chopra calls the bridge “speculative science.” The fact is that it is bad philosophy. But could you in fact talk about such a bridge? Yes, and that is precisely philosophy, good philosophy that is. I have tried to point that out several times, with minimal success (see my entry on Bridge between Science and Spirituality). Braden is typical of a lot of New age authors in that he starts with science but distorts it to draw unwarranted conclusions. Braden also makes up stuff and says it is science too. Throughout his books and lectures he keeps trying to reassure the audience with "this is proved scientifically" or "scientists do not doubt this", when in fact nobody with any scientific understanding could accept what he is claiming on the evidence that he presents. It just isn't science, period. It´s fascism and racism. What is his racistic view? Well, the crux of his book The God Code is that our DNA sequence, when read by assigning Hebrew characters to the base sequence, spells out the words of our Creator. So this is the big secret that he has discovered (at least I presume it is his discovery): within each cell of our body is God's signature in Hebrew. This is so openly a racistic version of Jews as the Chosen People as it can be. No more explanation is needed here. One can just wonder why no one criticizes him. He is after all quite a New Age guru. But as mentioned, the reason is Americans' historical inability (as Jacoby puts it) "to distinguish between real scientists and those who peddled theories in the guise of science" (read my entry on Anti-intellectualism and Anti-science). How, given the recent and unfortunate story of ideologically motivated conceptions of knowledge – Lysenkoism in Stalin´s Soviet Union, for example, or Nazi critiques of “Jewish science” – could it again have become acceptable to behave in this way? Gregg Braden is in a nutshell a reverse form of Nazi critiques of Jewish science. Or, rather, he is creating that Nazi fantasy of a Jewish science, which the Nazi´s sought to eliminate. In 1944, Max Planck, the father of quantum theory, shocked the world by saying that this "matrix" is where the birth of stars, the DNA of life, and everything between originates. Recent discoveries reveal dramatic evidence that Planck's matrix - The Divine Matrix - is real. It is this missing link in our understanding that provides the container for the universe, the bridge between our imagination and our reality, and the mirror in our world for what we create in our beliefs. To unleash the power of this matrix in our lives, we must understand how it works and speak the language that it recognizes. For more than 20 years, Gregg Braden, a former senior aerospace computer systems designer, has searched for the understanding to do just that. In this paradigm-shattering book, Gregg shares what he's found. Through 20 keys of conscious creation, we're shown how to translate the miracles of our imagination into what is real in our lives. With easy-to-understand science and real-life stories, Gregg shows us that we're limited only by our beliefs, and what we once believed is about to change! The above description is typical for Gregg Braden. He deducts from Planck to his own fantasies. It gives the impression that Planck supports Braden. Braden is one of the worst users of the thought distortion Research has Shown… Within Pseudoscience there has gone inflation in the phrase Research has shown that… Pseudoscience is seen in the New Age environment, where they demand that science has to be integrated with so-called “alternative sciences”, and in the intellectual environment in form of Reductionisms, which demand that science has to be integrated with, or is the same as, certain atheistic/political/postmodernistic views. Research has shown that... is a phrase, which often is used to convince the listener about that the one who talks can reason what he says with concrete empirical proof. But this is often just an example of subjective argumentation, a kind of unethical manipulation (often based on Wishful thinking), because it is extremely vague to claim that ”research has shown” anything, unless you can reason the assertion with specific details about the claimed research. Who has carried out this research? Which methods were there used? What exactly did they found out? Have their results been confirmed by others who work within the area? Prayer (meditation) is, as with other Matrix Sophists, a central form of Gregg Braden´s propaganda program. His “philosophy” involves intentional manipulation of behavior and the inducing of his racistic worldview. When used in combination with prayer (or meditation), prayer, or meditation, no matter what kind, comes to work as hypnosis (see my article Neuro-linguistic Programming (NLP) and Large Group Awareness Training (LGAT), The New Thought movement and the law of attraction, and Hypnosis, hypnotherapy, and the art of self-deception). Check the New Age propaganda website Gaia.com in the Matrix Dictionary, and you´ll get an idea of what Braden stands for. Click here for some videos on Gaia.com featuring Gregg Braden (if you want to pay for listening to them – but some are free to watch). Try to examine how his message is delivered in a thoroughly well-spoken but deeply patronizing manner. I can´t stop thinking: if this man is half of the scientist he claims to be, then he must be aware that he is fooling people. How on Earth can one have the moral to carry this pseudoscientific circus on one´s shoulders? It´s his entire life he´s using on it. 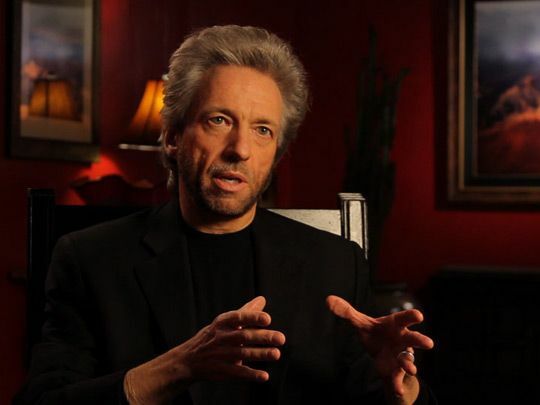 Click here for a video debunk of Gregg Braden by Chris White.